Creating the right kind of playlist for your outdoor activity or road trip is just one part of the adventure. 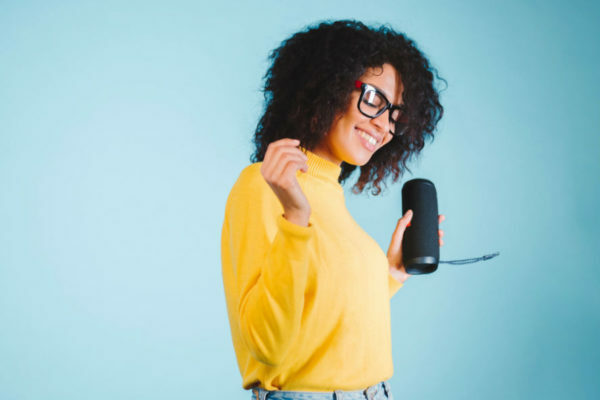 Finding the right audio device to play your carefully curated playlist is another thing to consider. Whether you are frolicking at the beach or enjoying the great outdoors, the ION Audio iSP83BK Stereo Boombox will be your best companion. 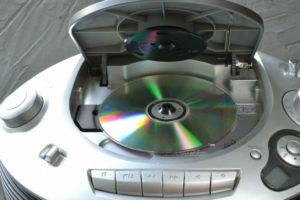 In this article, we will review the mentioned stereo boombox. Discuss its features, advantages, and disadvantages so you will have a better idea of what it can offer. The ION Audio iSP83BK Stereo Boombox features a distinct and rugged design. 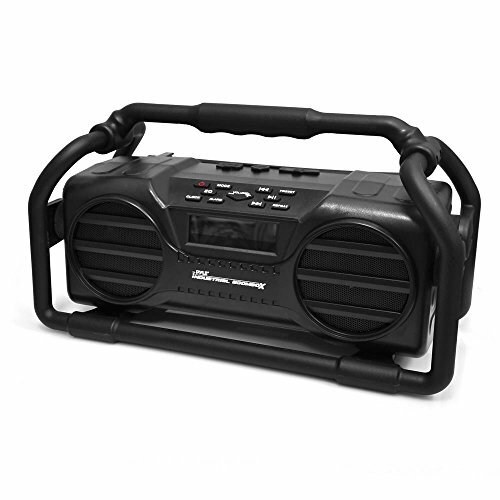 This boombox is perfect to bring along the beach or at your next pool party because aside from the fact that it is waterproof, it also floats! 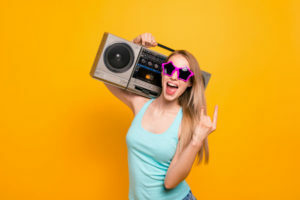 Moreover, if your choice of music is more pop and rock, then you will be delighted to know that this stereo boombox plays bass to the next level. It is also composed of a 40-watt amplifier to deliver high-impact and high-power sound that is great for parties or solo sound tripping. Now, your beach and pool party experiences will be no like other! Now, we are all aware that most people have their music on their smartphones and personal devices. 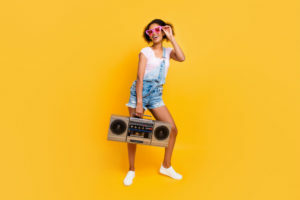 If you happen to have a playlist ready, then you can just connect it through Bluetooth, and the ION Audio iSP83BK Stereo Boombox will play your chosen song for you. There is even no need to fumble for wires because you can connect wirelessly! Another great feature of the ION Audio iSP83BK Stereo Boombox is its ease of use. Integrated into its design are functional buttons that allow you to play, pause, skip or forward your music. And do not forget about the battery life! One of the things that people are frustrated about is a device's short battery life. But fear not! The ION Audio iSP83BK Stereo Boombox has a rechargeable battery, so you do not need to worry about your playlist ending. Recharge anytime and continue your jam because its battery life lasts for hours! The ION Audio iSP83BK Stereo Boombox and your phone work hand in hand. If you have calls that need to be answered right away, you can do so through this stereo boombox. It connects seamlessly to your smartphone that you can take the call and use its built-in microphone. This way, your phone will be kept dry and safe from any untoward incidents especially if you are using this at the beach or near water. 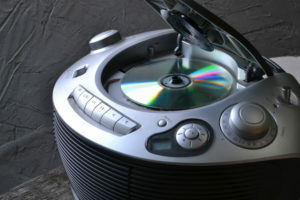 Believe it or not, there are still a lot of people who rely on FM radio. After all, this is still a great way to listen to music or discover new songs. The ION Audio iSP83BK Stereo Boombox can receive and broadcast various FM stations depending on the signal and reception. Furthermore, if Connectivity and Portability are two characteristics that rank high of importance for you, then it is your lucky day! This boombox has a convenient USB port so that you can connect your phone to this stereo boombox to get some charge. 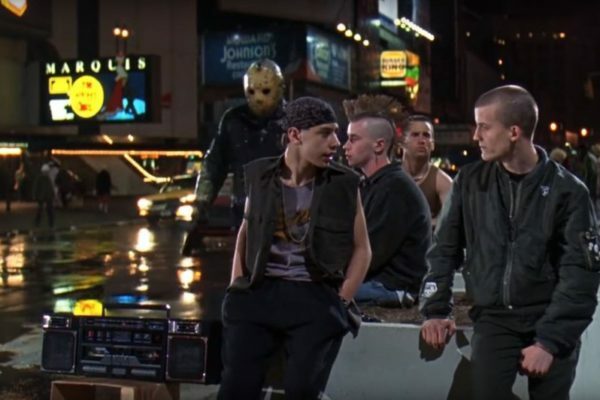 Also, if you have certain devices that are not Bluetooth compatible, you can still connect them to this boombox's 3.5mm audio input. 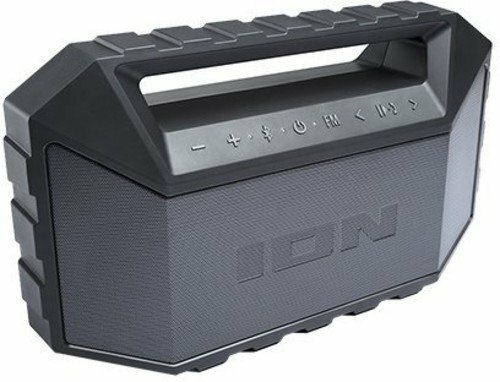 It also does not hurt that this ION Audio iSP83BK Stereo Boombox is portable and easy to carry because of its built-in handle. Isn't it great to know that you have various options for playing music? It is always difficult to find a nice stereo boombox especially since there is a variety and you have a lot of options. 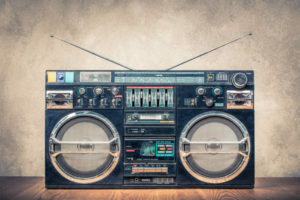 With the ION Audio iSP83BK Stereo Boombox, you get the significant features including Bluetooth connectivity, various options for connectivity, great bass and sounds, and even functional buttons. It is also advantageous that it has a rugged but waterproof design which is apt for traveling, or when you are on-the-go. If you often go to the beach, then you would be pleased that this stereo floats. You can swim and frolic while listening to your tunes. It also comes with a rechargeable battery which is pretty convenient if you do not have access to plugs or power outlets. There are other kinds of stereo boombox available. 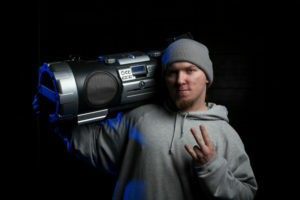 One of which is the Pyle PJSR350BK Industrial BoomBoX. It also features a rugged yet portable design. Although at first glance, it seems a bit bulky and much suited for the outdoors. Same with the ION Audio iSP83BK Stereo Boombox, it is capable of streaming music via Bluetooth. It is also splash-proof and water-resistant. It also comes with an FM radio, LCD, and alarm clock. 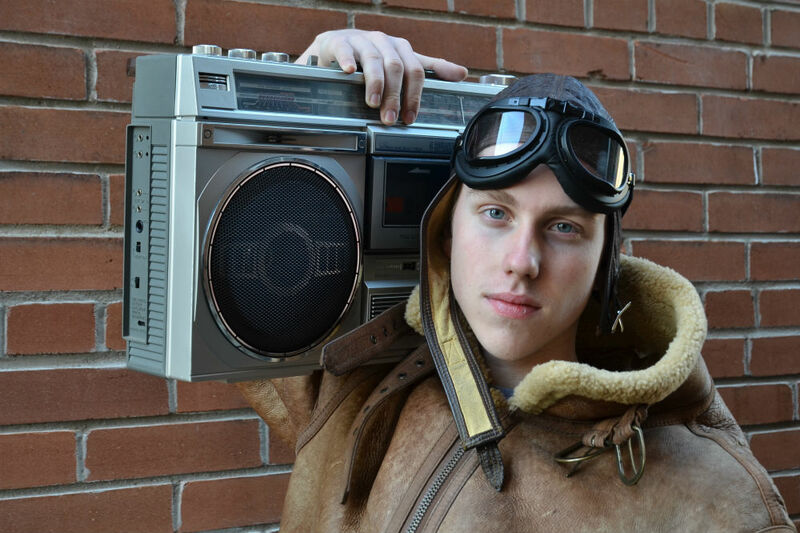 If you want a more rugged and outdoorsy stereo device, then you can consider the Pyle PJSR350BK Industrial BoomBoX. Overall, the ION Audio iSP83BK Stereo Boombox has a lot of exciting features. 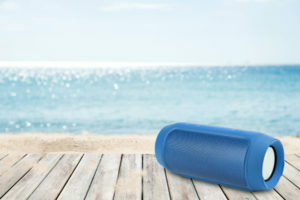 With it being waterproof, it is geared towards people who frequent the beach or those who love to listen to tunes while swimming. Additionally, your smartphones will be safe from untoward water accidents because they can be safely tucked at your bag on dry land. More importantly, you can still keep the party going as you can play music via Bluetooth. You may also connect your device to the available USB port. And never let a low battery stop you from enjoying your playlist! You can easily recharge this stereo boombox, and it can function for continuous use. Not to mention, you will love that it has functional buttons for easy use as well as a built-in handle for portability. You can play, pause, or forward your songs at your convenience! If you are the one who does not settle for poor sound quality, the ION Audio iSP83BK Stereo Boombox is a must-have stereo device. Get access to good music anytime and anywhere!